The nation's number one fishing port! Unalaska's Port of Dutch Harbor is renowned as a major commercial fishing port. It that has led the nation in volume of landings for 20 consecutive years. The largest fishery is the pollock fishery, with landings of more than 1.5 million metric tons per year. Pollock is fished for by small trawlers (such as the one pictured above) who deliver to local shoreside plants, and by large factory trawlers, who process and freeze the product while at sea. Pollock is fished during two seasons per year, the 'A' season which begins in January, and the 'B' season, which begins in June. Other fish species of economic value include Pacific cod, halibut, Atka mackerel, sablefish, and yellowfin sole. The crab fisheries have played a historic role in the life and economy of Unalaska, although declining quotas in recent years have changed the nature and importance of these fisheries. Red king crab, opilio (pictured below) and bairdi Tanner crab are the main species that are currently fished out of Dutch Harbor. In the mid-80s, huge quotas for red king crab led many young men north to the Bering Sea to find their fortune. At one point more than 300 crab boats fished out of Dutch Harbor in a wild-west derby-style fishery. 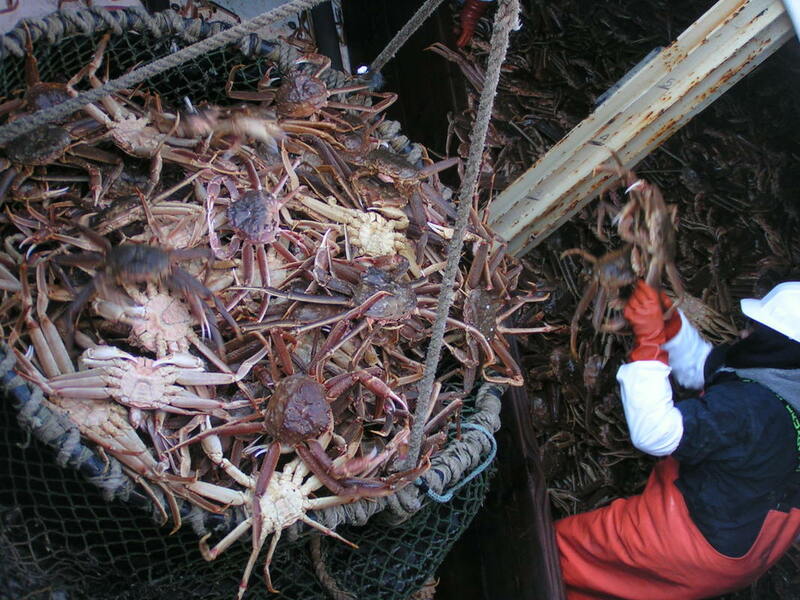 The Discovery Channel's series "Deadliest Catch" highlights the current crab fishery, and is filmed out of Dutch Harbor.